Japanese customizers give the big Bentley the cotton-candy treatment. Fans of the crazed Japanese tuning company Office-K may remember the Rolls-Royce Phantom it turned pink several months ago. Mansory&apos;s done the same with a Bentley Continental GT, but this time Office-K is back with the top-of-the-line Mulsanne. 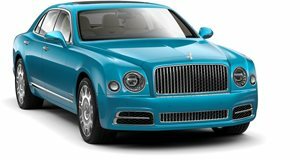 Finished in a a shade we&apos;ll call Metallic Pepto, the custom Mulsanne features has been outfitted with LED daytime running lights and a set of Forgiato DITO 24-inch three-piece wheels with chrome face and pink details. Outlandish it is, subtle it is not.